Soon the village had to face a problem that confronted every pioneer settlement across the land – the problem of their first death. In 1854 a young boy, C.B. Buckman, drowned while crossing Saratoga Creek. Because there was no established cemetery, the villagers buried him in an open area beyond the land owned by McCarty. With time, others were buried in the area also. For some time ownership of the McCartysville property had been in question. Eventually a survey indicated, and the Federal government confirmed, that both the burial ground and the town of McCartysville were located within El Quito Rancho, land owned by Jose Ramon Arguello. While the residents of McCartysville had to repurchase their lots, Arguello decided to define a parcel of land 300 feet on a side (slightly more than two acres) and dedicate it to public use as a burial ground. The residents of the area soon realized that there needed to be an organization to operate the cemetery. 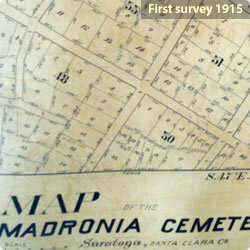 The Madronia Cemetery Association was formed in 1863 to administer the cemetery. Meanwhile, in 1864 the residents voted to change the name of the community to “Saratoga.” Mineral water from the springs outside town had been analyzed and found to have nearly the same chemical composition as the water from Saratoga Springs, New York, thus Saratoga seemed an appropriate name for the little village. In the years before the Cemetery Association was formed, burials were made with little effort to follow a prescribed order or establish any record. Some sites were not marked while others had wooden markers that decayed and disappeared over the years. One of the first matters of the new Cemetery Association was to establish a system for recording new burials and plot ownership. Over the years the Cemetery Association had two concerns, finance and upkeep. Shortly after the Association was formed a the decision was made to fence the property, first to mark the boundaries, and second to keep livestock from wandering on to the cemetery. Because the association had no funds, a subscription list was circulated. Several families paid in fence posts and lumber while others gave cash. The fence was built but the financial problems persisted. From time to time, subscription drives were held to raise funds for maintenance but developing a reliable form of funding proved to be difficult. Upkeep was an even more vexing problem. Individual families were responsible for maintaining grave sites. An 1887 rule stated “All parties improving and cleaning up their lots must dispose of the refuse by carting or depositing outside the cemetery. It must in no case be deposited on other lots or avenues.” As years passed some families moved from the area and others died and left no survivors to care for the lots. Community workdays were held from time to time to clean the cemetery but maintenance remained a problem. In the 1890s an annual fee was instituted. Plot owners could choose between self-maintenance and paying a fee. The plan did result in better care of some plots but it did not solve the problem of plots with no surviving family members. In 1912 it was evident that the annual care fee could not be collected indefinitely. An optional perpetual care fee was instituted. Those who preferred could continue to maintain gravesites while others paid the fee. The fee was invested and only the income used in maintenance but the income was far short of the amount needed to maintain the cemetery. Jennie Farwell, a Cemetery Trustee and a member of a family with a long association with the Cemetery Association – her father and her brother served as Trustees before her – died in 1922. She willed the Cemetery $2000 “to be used as the Trustees see fit in fixing up and beautifying this cemetery.” Three hundred dollars was used immediately to improve recently purchased land. The remaining money was placed in the Permanent Care Fund. In 1926 it was learned that the legislature had established authority to form a special district for cemetery operation. 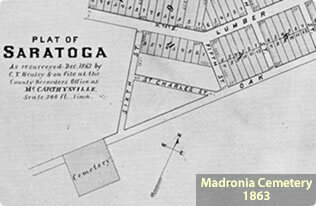 The Saratoga Cemetery District was formed in 1927 to administer the cemetery. Formation of the district was approved by 95% of the voters in the district. 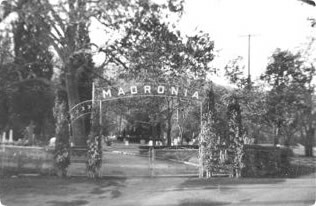 While other pioneer cemeteries have faded into obscurity, Madronia Cemetery survived the problems of its early years and is now financially sound and will serve the needs of the Saratoga community well into the future. Cunningham, Charles N. Saratoga’s Oldest Institution- Madronia Cemetery. Unpublished manuscript prepared for the Saratoga Historical Foundation, 1961. Cunningham, Florence R. Saratoga’s First Hundred Years, Edited by Frances L. Fox. Fresno. Panorama West Books, 1967.